The Totals - Went 3-4 with 4 saves and a 3.38 ERA (16 ER, 42.2 IP) with 53 strikeouts and 16 walks in 31 relief appearances across 4 levels of the Rays minor league system...DL Stints - On the disabled list April 18-May 18 (right calf strain) and May 31-June 21 (left calf strain)…made rehab appearances with GCL Rays (6/19) and High-A Charlotte (6/21)... On the Move - Began the year with Double-A Montgomery, where he made 9 appearances before landing on the disabled list…after returning from second DL stint, joined Triple-A Durham and recorded 35 strikeouts and only 8 walks in 27.0 innings across 20 outings. Combined to go 3-3 with a 3.20 ERA (70.1-IP, 25-ER) in 43 apps (5 starts)…split the season between Double-A Erie and Triple-A Toledo for a second consecutive year…averaged a careerhigh 9.73 SO/9 IP…made 20 apps for the Leones del Caracas in the Venezuelan Winter League …pitched for Caracas for a third straight year. April 23, 2019 Seattle Mariners optioned RHP R.J. Alaniz to Tacoma Rainiers. April 22, 2019 Seattle Mariners optioned RHP R.J. Alaniz to Tacoma Rainiers. April 12, 2019 Seattle Mariners recalled R.J. Alaniz from Tacoma Rainiers. March 1, 2019 Seattle Mariners optioned RHP R.J. Alaniz to Tacoma Rainiers. 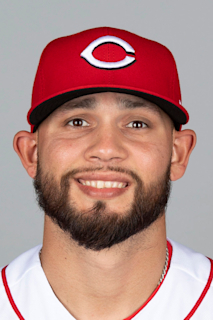 November 15, 2018 Seattle Mariners signed free agent R.J. Alaniz. November 2, 2018 RHP Ruben Alaniz elected free agency. August 25, 2018 Durham Bulls activated RHP Ruben Alaniz from the temporarily inactive list. August 22, 2018 Durham Bulls placed RHP Ruben Alaniz on the temporarily inactive list. June 25, 2018 RHP Ruben Alaniz assigned to Durham Bulls from Charlotte Stone Crabs. June 20, 2018 RHP Ruben Alaniz assigned to Charlotte Stone Crabs from Montgomery Biscuits. June 19, 2018 Montgomery Biscuits sent RHP Ruben Alaniz on a rehab assignment to GCL Rays. June 4, 2018 Montgomery Biscuits placed RHP Ruben Alaniz on the 7-day disabled list. May 20, 2018 Montgomery Biscuits activated RHP Ruben Alaniz from the 7-day disabled list. April 18, 2018 Montgomery Biscuits placed RHP Ruben Alaniz on the 7-day disabled list. April 2, 2018 RHP Ruben Alaniz assigned to Montgomery Biscuits. December 14, 2017 Tampa Bay Rays signed free agent RHP Ruben Alaniz to a minor league contract and invited him to spring training. November 6, 2017 RHP Ruben Alaniz elected free agency. October 9, 2017 RHP Ruben Alaniz assigned to Leones del Caracas. September 8, 2017 Toledo Mud Hens activated RHP Ruben Alaniz from the 7-day disabled list. September 1, 2017 Toledo Mud Hens placed RHP Ruben Alaniz on the 7-day disabled list. June 22, 2017 RHP Ruben Alaniz assigned to Toledo Mud Hens from Erie SeaWolves. December 9, 2016 Detroit Tigers invited non-roster RHP Ruben Alaniz to spring training. October 6, 2016 RHP Ruben Alaniz assigned to Leones del Caracas. August 4, 2016 RHP Ruben Alaniz assigned to Erie SeaWolves from Toledo Mud Hens. June 29, 2016 RHP Ruben Alaniz assigned to Toledo Mud Hens from Erie SeaWolves. May 9, 2016 RHP Ruben Alaniz assigned to Erie SeaWolves from Toledo Mud Hens. April 25, 2016 RHP Ruben Alaniz assigned to Toledo Mud Hens from Erie SeaWolves. April 2, 2016 RHP Ruben Alaniz assigned to Erie SeaWolves from Toledo Mud Hens. March 2, 2016 RHP Ruben Alaniz assigned to Detroit Tigers. December 11, 2015 RHP Ruben Alaniz assigned to Toledo Mud Hens. December 3, 2015 Detroit Tigers signed free agent RHP Ruben Alaniz to a minor league contract. November 6, 2015 RHP Ruben Alaniz elected free agency. October 27, 2015 RHP Ruben Alaniz assigned to Leones del Caracas. September 30, 2015 RHP Ruben Alaniz assigned to Leones del Caracas. August 4, 2015 Corpus Christi Hooks activated RHP Ruben Alaniz from the 7-day disabled list. July 27, 2015 Corpus Christi Hooks placed RHP Ruben Alaniz on the 7-day disabled list. June 9, 2015 Corpus Christi Hooks activated RHP Ruben Alaniz from the restricted list. August 30, 2014 Corpus Christi Hooks placed RHP Ruben Alaniz on the restricted list. August 29, 2014 Corpus Christi Hooks placed RHP Ruben Alaniz on the temporarily inactive list. July 6, 2014 Corpus Christi Hooks activated RHP Ruben Alaniz from the 7-day disabled list. June 19, 2014 Corpus Christi Hooks sent RHP Ruben Alaniz on a rehab assignment to GCL Astros. May 8, 2014 Corpus Christi Hooks placed RHP Ruben Alaniz on the 7-day disabled list retroactive to May 4, 2014. April 23, 2014 RHP Ruben Alaniz assigned to Corpus Christi Hooks. August 18, 2013 Corpus Christi Hooks activated RHP Ruben Alaniz from the 7-day disabled list. August 10, 2013 Corpus Christi Hooks placed RHP Ruben Alaniz on the 7-day disabled list. April 1, 2013 RHP Ruben Alaniz assigned to Corpus Christi Hooks from Lancaster JetHawks. September 20, 2012 Ruben Alaniz roster status changed by Lancaster JetHawks. July 27, 2012 Lancaster JetHawks placed RHP Ruben Alaniz on the 7-day disabled list. July 21, 2012 Lancaster JetHawks activated RHP Ruben Alaniz from the 7-day disabled list. June 26, 2012 Lancaster JetHawks placed RHP Ruben Alaniz on the 7-day disabled list. June 14, 2012 Lancaster JetHawks activated RHP Ruben Alaniz from the temporarily inactive list. June 10, 2012 Lancaster JetHawks placed RHP Ruben Alaniz on the temporarily inactive list. April 3, 2012 RHP Ruben Alaniz assigned to Lancaster JetHawks from Lexington Legends. March 31, 2012 RHP Ruben Alaniz assigned to Houston Astros. August 27, 2011 Ruben Alaniz roster status changed by Lexington Legends. August 24, 2011 Lexington Legends placed RHP Ruben Alaniz on the 7-day disabled list retroactive to August 16, 2011. April 4, 2011 RHP Ruben Alaniz assigned to Lexington Legends from Greeneville Astros. June 15, 2010 Houston Astros signed RHP Ruben Alaniz. June 15, 2010 Ruben Alaniz assigned to Greeneville Astros.